We, Aileen and Derek have been owned by Bassets since 1970. It can be a difficult breed to live with but what we found was that it was a diffcult breed to live without. Our first Basset was Balleroy Sirocco (Samson) who introduced us to Bassets and changed our way of thinking for ever. When a basset owns you, you start to think like one - you have to, to keep one step ahead of them. Our showing started not long after our lovely Samson came to live with us and we have been hooked ever since. We don't go racing all over the country every weekend, but are enthusiastic enough to have been involved with, not only the Scottish Breed Club, but also with the Scottish Kennel Club (Derek having been an Executive Council Member), the Hound Association of Scotland (Derek having been Show Manager), the Caledonian Canine Society (Derek having been Treasurer) and assisting on the Show Team of Border Union Agricultural Society's Dog Show section for many years. Derek has recently retired from being involved with Perthshire Canine Club for over 35 years of which the last 15 years he served as its President and Chairman. This was in addition to being the Secretary of The Basset Hound Club of Scotland for over 20 years where Aileen was also very involved being its Treasurer. This is all very hard work and time consuming, not to mention expensive. Our "Home Team" at present consists of - Eleven year olds Dex and Tofi, Eight year olds Luna, Esta and Sola. The only reason we have so many eight year olds is that we had one of our pups returned to us when she was only a few months old - and she just stayed. We both judge at Championship Show level and judge Hound Groups at Open Show level. Judging is a very enjoyable, interesting and educational experience. We are very committed to the improvement of the breed and travel throughout the UK and Europe to look at the quality of Basset Hounds being bred today. 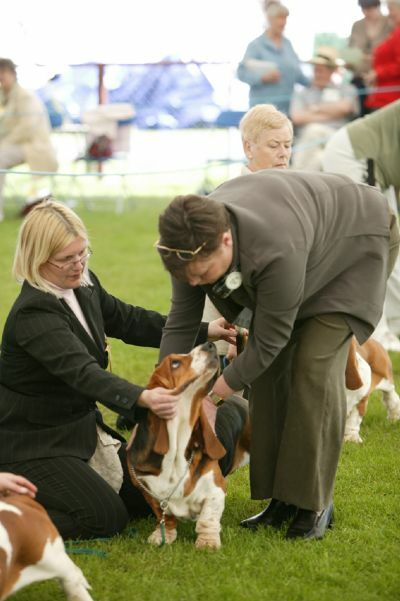 Aileen was active for many years in the role of Breed Health Representative of the Basset Hound Club of Scotland and currently serves as the Kennel Club Breed Education Co-ordinator for Basset Hounds throughout the UK. If you would like to chat with us about any aspect of Basset Hounds, please don't hesitate to email us with your queries. We do not profess to be "experts", as we are continually learning, but with almost 50 years of experience, we have encountered most of the issues concerning Basset Hounds.